I’m probably preaching to the choir here as the people who should read this probably won’t (next-door they have the Dana Point Times lying in their driveway for a week unread!) I love living here in Dana Point, my adopted home town. We are so lucky to live here with all of the natural beauty. In terms of the local neighborhood of the Lantern Village, I feel it’s such a shame that it doesn’t live up to its potential. It could be so quaint and charming. Ever wonder about the differences in property values between here and say Corona Del Mar or Laguna Beach? Just look around, some of us keep our properties up with pride. Unfortunately, others around us don’t share this pride of ownership. The streets are loaded with cars because people have their garages full of junk, trash cans are left in driveways and not put away and some just leave piles of junk out front. Dead trees and unkempt yards are commonplace. 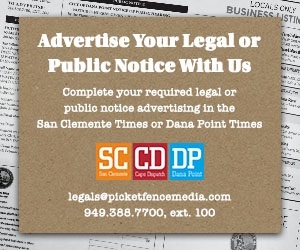 Where is the City of Dana Point Code Enforcement? I don’t get it!